When the 2018 Subaru Outback rolls away, owners and onlookers know two things. The first is that the build and quality are made to last. The second is the standard all-wheel drive will let this SUV handle weather's worst challenges. At Flatirons Subaru, trim levels offer value packages that help fit the Outback to the owner's needs and lifestyle in Boulder Colorado. Outbacks have every angle of modern transportation covered. Safety is assured with a five-star federal rating. Plus, Subaru Eyesight adds collision avoidance features to the menu. Two engines offer fuel-efficient AWD travel with performance to match your needs. The large cabin is complemented by a generous cargo hold, allowing you to move five people and their luggage without crowding. Integrated roof racks with cross bars provided up to 150-pounds of carrying capacity. Dash tech provides connectivity for entertainment and information. Symmetrical All-Wheel Drive is complemented by high ground clearance. The 2.5i edition has a 2.5L engine that churns out 175 lb-ft of torque. This smart earner has a 32 mpg highway rating. Drivers will like the paddle shifters for some manual driving fun. 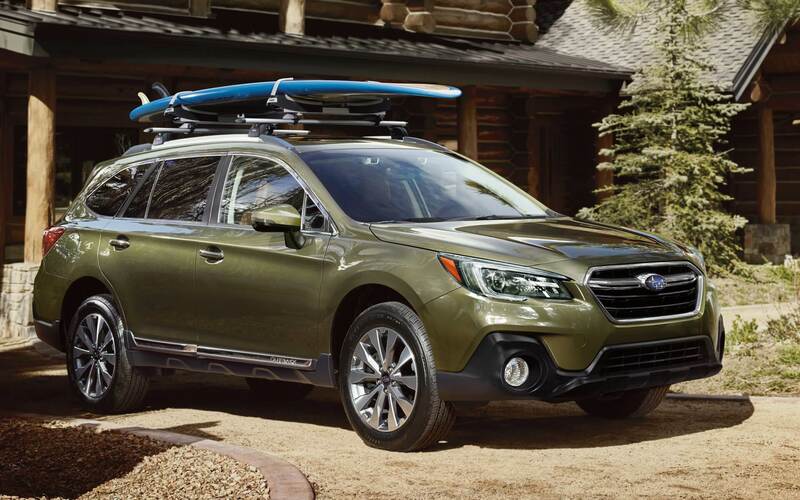 Earning its right to be called an Outback, this wagon has an X-mode that allows it to handle trails. Active Torque Vectoring helps with regular road travel, offering more confidence on curves. Hill Descent Control fights the effects of gravity, regulating downhill travel. It can tow up to 2,700 pounds. Outbacks have a well-trimmed interior with 109 cubic feet of passenger space. There's plenty of headroom and legroom for the second-row passengers. They also have reclining chairs and an available armrest to make them more comfortable. Cloth seats are complemented by a silver metallic accent trim. The cargo hold measures 35.5 cubic feet. It has a sub-floor compartment, a helpful tray, and cargo hooks. Area increases to 73.3 cubes with the rear seats folded flat. On the dash, you'll find a 6.5-inch touchscreen. Features include Pandora and Aha apps. Android Auto and Apple CarPlay connectivity expands your voice control capability and provide access to dozens of apps. With so much aboard, the base edition may be all a family needs to enjoy daily travel. If you want a bit more, the 2.5i Premium makes it easy to cover all of the bases. Expanding your dash tech options, the 8-inch touchscreen provides STARLINK cloud-based apps such as Magellan navigation and Yelp. Sirius XM connectivity and HD radio are on board. Your Harman Kardon premium audio system has a 576-watt Greenedge amplifier and twelve speakers. Passengers will appreciate two front-seat and two rear-facing USB ports. Electroluminescent instrumentation adjusts more readily to light conditions. The driver's chair can be power-adjusted in ten positions. Providing more storage, a center console includes a 12-volt charger and an enclosed compartment. For security, this edition adds a retractable cargo hold cover. Colorado drivers tend to like this edition because cold is under control with heated seats and dual-zone automatic HVAC system. Windshield wipers have a de-icer. The side mirrors can be power-heated to wipe away ice or frost. Crash avoidance features are available in the EyeSight Driver Assist package. This Outback provides a balance between your budget and your high tech needs in Boulder Colorado. You can find out about trim levels pricing when you visit Flatirons Subaru serving Denver Broomfield Boulder. Ready for more? Outback 2.5i Limited drivers will feel in charge with push button start. Keyless access on this edition includes convenient PIN-code access. Helping you find your way, the Subaru STARLINK Multimedia Plus system adds built-in navigation. The rear gate has a power function with height memory for your convenience. Leather seats and woodgrain accents create an upscale look. Both front seat positions are power chairs, and the back outboard seats gain power-heat functions. A blind spot detection system watches for traffic alongside the vehicle and helps the driver avoid trouble. Complementing the rearview camera, a rear cross-traffic alert helps with reverse maneuvers. Subaru EyeSight features are options to expand collision avoidance capability. This edition will make you a bigger fan of luxury living, but it doesn't come with the high pricetag of a luxury SUV in Boulder Colorado. The Touring edition has an appropriate name. This Outback is prepared to protect you on the longest journeys. A forward collision warning and an autobrake make this edition especially desirable. You also get a lane keeper and adaptive cruise control. LED Steering Responsive Headlights illuminate the actual path by moving the light with the wheels as they take curves. A reverse automatic braking system, a rare system on today's cars, tries to stop fender benders. In this leather-clad cabin, the look is accented with silver and woodgrain. Colorado Outback 2.5i Touring drivers will appreciate a heated steering wheel. With this edition, owners will have less stress in their daily commutes and more luxury at their fingertips. You can check out these and other trim levels of the 2018 Subaru Outback. Enjoy a visit at Flatirons Subaru serving Denver Broomfield Boulder. Take a test drive and discover which trim is right for you.